Murder and mayhem took over Picton on Labour Day Weekend, but it was actually a good thing. The second annual Women Killing It Crime Writers’ Festival brought together nine female mystery writers from Ontario and Western Canada to talk about their latest murderous tales and to hold workshops for writers and the public to learn about the creative process. 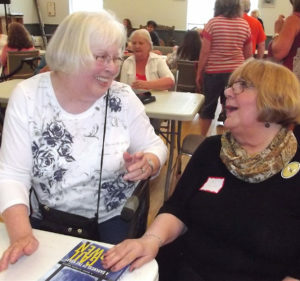 The event was organized by local crime writers Janet Kellough, who was also one of the participating writers, and Vicky Delany. It kicked off with a group session on Friday, Aug. 31, at the Picton Town Hall, where each author had a chance to chat with members of the public. The nine authors taking part this year in addition to Kellough were Gail Bowen from Regina, R.M. Greenaway from Nelson, B.C., and Ontario writers Catherine Astolfo, Y.S. Lee, Caro Soles, Kim Moritsugu, Linda Wiken and another local writer, Laurie Scott of Picton. Their work covers everything from traditional murder mysteries to science fiction, books for young people and even erotica. Delany, who was among last year’s participants, said the response to the weekend was extremely good. The moderator for Friday’s event was Lynn Pickering, who kept things moving as the authors moved from table to table to meet with fans and discuss their books — dubbed speed dating with authors. Refreshments were provided by Food Not Bombs. “It’s my second time reading in Picton,” commented Bowen, who is well known for her series of mysteries set in Regina. While originally from Ontario, she’s lived in Regina for 50 years, and likes using what is now her home town as the setting for her books. “The same things go on in Regina that go on everywhere else,” she said. Lee said her newest book is the first in a new series called The Agency. She called the book a coming-of-age story. Friday’s event included a table from the local bookstore, Books & Company, filled with books which could be purchased and signed by the authors. Saturday included a writers’ workshop with Delany at the Picton Library, a gathering back at town hall with four writers who tackle the darker side of the murder-mystery genre and a tea with writers of lighter mysteries at St. Andrew’s Presbyterian Church, presented in cooperation with The Friends of Rose House Museum. There was an added writers’ workshop, this time with Bowen, at the library on Sunday.